For other people named George Coe, see George Coe (disambiguation). George Coe (May 10, 1929 – July 18, 2015) was an American stage, film and television actor and voice artist. He did voice-over work in video games, movies and TV shows. He was a cast member for the first season of Saturday Night Live and voiced the character of Woodhouse in Archer. Coe was born George Julian Cohen in Jamaica, Queens, New York. His Broadway theater career began in 1957 and included turns as "M. Lindsey Woolsey" opposite Angela Lansbury in the original production of Mame; as "Owen O'Malley" in On The Twentieth Century, and creating the role of David in the original Broadway production of Company. Coe was an original member of the "Not Ready For Prime Time Players", the original cast of Saturday Night Live, but he was only credited as a cast member for the first show, October 11, 1975. Coe was used in several other episodes of SNL, but was never again credited. In 1979 he appeared as the head of Dustin Hoffman's character's advertising firm in the Academy Award-winning Kramer vs. Kramer. Coe was nominated for an Academy Award for the 1968 short film The Dove, a parody of Ingmar Bergman's films, which he also co-directed. Coe also played the role of Brigadier General Scott Watson in the 1986 movie Remo Williams: The Adventure Begins. He guest-starred on a 1991 episode of Star Trek: The Next Generation. He also portrayed Ben Cheviot, the eventual head of Network 23, on the series Max Headroom. 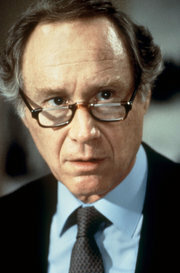 His various television appearances include Murder, She Wrote, Bones, My Wicked, Wicked Ways: The Legend of Errol Flynn, Judging Amy, The King of Queens, Nip/Tuck, Grey's Anatomy, Columbo, Curb Your Enthusiasm, Gilmore Girls, The Golden Girls, Wilfred, and as Senator Howard Stackhouse in two episodes of The West Wing. He voiced the character of Woodhouse, the much-put-upon valet in the FX animated series Archer. He voiced the Autobot Wheeljack in Michael Bay's Transformers: Dark of the Moon. Coe provided voice acting for the video games The Elder Scrolls V: Skyrim, Star Wars: The Old Republic, and Guild Wars 2. Coe died on July 18, 2015, at the age of 86, after a long illness, in Santa Monica, California. The eighth season of Archer (the primary arc of which revolves mostly around the death of his character Woodhouse) was dedicated to him. ^ Chawkins, Steve (26 July 2015). "George Coe, character actor and veteran of 'Saturday Night Live,' dies at 86". The Washington Post. Retrieved 11 March 2019. ^ "Transformers: Dark of the Moon". rottentomatoes.com. Retrieved 4 January 2017. ^ McNary, Dave (20 July 2015). "George Coe, Oscar-Nominated Actor and SAG Activist, Dies at 86". variety.com. Retrieved 4 January 2017.